I have been a complete slug in the work out realm recently. Work has been overwhelming, there was a lot of traveling which can really set back a work out routine, then there was a slight ankle sprain and then I just got lazy. Dave forced me to work out this morning; I went to the gym kicking and screaming and pouting the whole way. Of course I feel better now, but I'm not about to admit that to him. The only reason I went was because I knew if I didn't go he would razz me about it all day - talk about annoying! Hunger kicked in. Here's what's in the fridge: some left over wheat pasta, some condiments like mustard, tonic water, eggs, part of a red onion, a few stalks of celery, a little hunk of cheese, 2 cloves of garlic, a few strips of bacon, beer and batteries. I can make breakfast out of that. Get out a skillet and let's start cooking! cook until the back is nearly cooked. drain most of the bacon grease, but leave a little in the pan. cook this all together on a medium heat. Cook this, tossing occasionally, until the potatoes are soft. 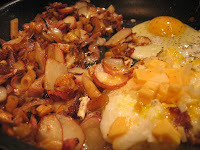 Push aside in the skillet while you cook the eggs. This will allow the bottom to form nice crusts on the potatoes and pasta. Add eggs and season with pepper. I prefer a more runny yolk, Dave likes his fried or scrambled. Also add any cheese you have to the potato mixture. Cover and let the eggs cook and the cheese become melty. 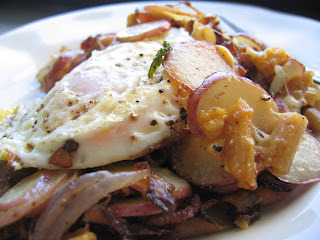 Serve immediately, topping the potato mixture with your eggs. If you have it, top with parsley. If you worked out- pat yourself on the back. If you didn't, I'm jealous. 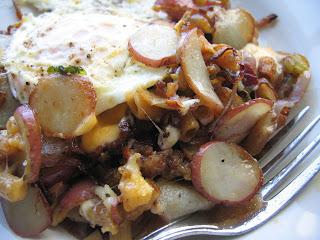 Either way- try this hearty classic breakfast, enjoy and be fat and happy!